Fall is right around the corner as the crisp autumn wind makes its way into our area. Fall's arrival brings with it various insect pests and rodents, causing infestations in homes across the state. Taking action now can help prevent unwanted pests in your home through the winter season. Sorenson Pest Control wants to inform you of which pests to look out for and how to prevent them from infesting your home. Seal any openings around your home. Gaps around windows and doors make the perfect entryways for pest insects. Whether it's a slight gap around a dryer vent or a gaping hole next to the plumbing fixtures, pests will use these spaces to get inside your house. You can plug up holes, cracks and gaps with a silicone sealant or a foam spray. If you ignore these entryways, you're setting yourself up for an infestation over the fall. Clean up debris in your yard. Insects and rodents like to gather around debris, from broken tree limbs to old tires. Something as simple as an unused kiddy pool will attract insects underneath, where they breed and multiply before expanding out into the yard and your home. Pick up all the debris from around your property to reduce pest breeding sites. Move the trash bins away from your house. Placing your trash bins next to your home sets you up for an unwanted pest infestation. After all, trash brings pests out by the hundreds, and they're all right next to crevices, doorways and windows where they can make their way inside. It's best to place the trash bins near the roadside or at least 10 or more feet away from the house to reduce the likelihood of pest infestations. 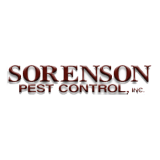 Contact Sorenson Pest Control for more information about our fall pest control services. When pests rear their ugly heads, our technicians are there to eliminate them for good. No matter if it's stinkbugs or other fall pests, we'll create a customized plan to give you a pest-free home throughout the cooler seasons.